John Buckingham and Nicole Gelinas round out Researchs expert investment roundtable, assessing opportunities and risks for the coming year. Astute investors take cues from history as they analyze the present to detect prospects for the future. It’s a delicate balance and one that’s particularly critical in anticipating what is in store for the U.S. economy and securities markets in 2015. 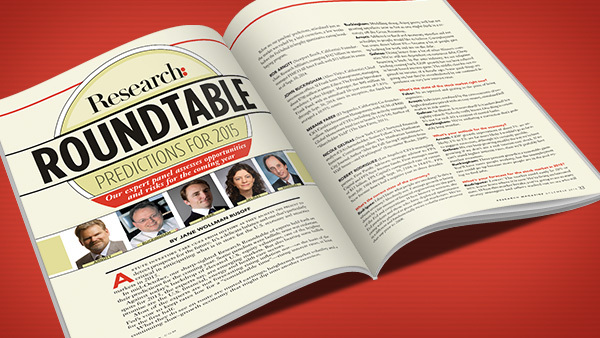 In mid-October, our sharp-sighted Research Roundtable of experts held forth on their predictions for the coming year. Some panelists were bullish; none was exuberant. Against today’s backdrop of elevated U.S. equity valuations, one of the brighter spots for 2015, the experts say, are emerging markets. But also bearing some bullish promise are the U.S. financial, energy and health care sectors. Most of the experts are not forecasting rising inflation nor—on the basis of the Fed’s vow to keep rates low for a “considerable time”—rising interest rates, at least for the first half. What they do see en route are muted earnings, heightened market volatility and a continuing slow-growth economy that might dip into another recession. Below are our panelists’ predictions, articulated just as the market was rocked by a brief correction, a few weeks before the Fed halted its lengthy quantitative easing bond-buying program. ROB ARNOTT (Newport Beach, California) Founder-chair, Research Affiliates, managing $182 billion in assets; manager PIMCO All Asset Fund, with $33 billion in assets as of Sept. 30, 2014. JOHN BUCKINGHAM (Aliso Viejo, California) Chief investment officer, Al Frank Asset Management, managing about $700 million in assets. Editor, The Prudent Speculator newsletter. Forbes blogger. Manager, the $90 million Al Frank Fund, with an annualized 10-year return of 7.83% through Sept. 30, 2014; since its inception, the fund has averaged a 10.93% return. MEBANE FABER (El Segundo, California) Co-founder-CIO, Cambria Investment Management, with AUM of $400 million. Manager of ETFs, including the actively managed Global Momentum fund (set to launch 11/4/14). Author of “Shareholder Yield” (The Idea Farm, 2013). NICOLE GELINAS (New York City) Chartered financial analyst (CFA) charterholder. Senior Fellow, The Manhattan Institute. Contributing editor, The Manhattan Institute’s City Journal. Author “After the Fall: Saving Capitalism from Wall Street—and Washington” (Encounter Books, 2009). ROBERT RODRIGUEZ (Los Angeles) CEO-managing partner, First Pacific Advisors; strategic advisor to FPA Capital and FPA New Income funds. Firm manages assets of $33 billion. FPA Capital’s compounded rate of return from July 1984 through Sept. 30, 2104, is 14.65%. FPA New Income hasn’t had a negative year in three decades. Rodriguez: I don’t know what people are smoking! Is this a vibrant economy? Absolutely not. Earnings growth is being driven by a fair amount of financial engineering on the part of the Fed and corporations. When history is written, the Fed presidents and those who have deployed quantitative easing will be glorified as great snake-oil marketers. We’re in a different and fundamentally more volatile environment than any prior to 2008. Buckingham: Muddling along, doing pretty well but not growing anywhere near as fast as one might think in a recovery off the Great Recession. Arnott: Addicted to fiscal and monetary stimulus and not as healthy as people would like to believe. Unemployment has come down below 6%—because a lot of people gave up looking for work and are on the dole. Gelinas: Doing better than a lot of other Western countries. We’re still too dependent on consumer debt. Cheap financing is back: In the auto industry, we see subprime lending coming back. GDP growth has not been reflected in broad-based income gains. The middle class has not regained its income of a decade ago. Some good things are going on, but they’re overshadowed by our continued dependence on very low interest rates. What’s the state of the stock market right now? Faber: In an uptrend and getting to the point of being expensive. Arnott: Indecisive, confused by the cross-currents of too-high valuations paired with an easy-money, stimulated bull market in risk assets. Gelinas: An illusion. Is it overvalued? Is it undervalued? Is it rightly valued? Nobody really knows. One thing is certain: It’s not for real. It’s a creation of central banks. Buckingham: We’re enduring a correction that’s probably long overdue. What’s your outlook for the economy? Arnott: GDP growth expectations of about 3% are unlikely; 1% to 2% are far more likely. I wouldn’t go so far as to suggest recession, although it’s certainly possible. Gelinas: We can keep growing steadily the way we’ve been growing if we don’t see a real interest-rate shock. If we can’t stand higher interest rates, then we’ll probably have another recession. Buckingham: Three percent growth is a reasonable guess. You’ll have more people working, but the unemployment rate could go up because more people are in the pool trying to find jobs. What’s your forecast for the stock market in 2015? Rodriguez: Lower! The market could easily be 20% or 30% lower from where it is now. We’re living on borrowed time. When this market breaks, you’re going to see so many money managers and others washed out to sea who will never see land again. It will happen between now and 2018. Faber: For the next 10 years, we expect stocks to do maybe 3% a year in the U.S. based on long-term valuations. Buckingham: Given that it’s the third year of the presidential cycle, which, historically, has been positive, and that we’re in the middle of a correction, between now and a year from now stocks will be higher and in line with the historical 10%–12% return—maybe a little better. Arnott: I’m a cautious bear on U.S. equities. Now that the monetary stimulus [has been] lifted, the market anticipates robust growth to bail out current investors. But that’s likely to disappoint. We’re still in an environment of hyper-regulation and gotcha-rulemaking, where folks who thought they were abiding by the law suddenly find that a reinterpretation of the rules has them on the wrong side. That makes people cautious. Gelinas: [The market is] dependent on the very low interest rates. It really says nothing about the underlying companies themselves. Faber: Not super-attractive, but we do consider bonds to be reasonable to include in a diversified portfolio. Rodriguez: Bond exposure should be maintained only in the highest quality areas. The big spread expansion and deterioration in credit quality is something that you will see more frequently over the next couple of years, and the high-yield market is going to get hammered. Arnott: Very mildly bullish on bonds mostly because of an expectation of a weak economy. Essentially 100% of the bond pundits are bears, which means that the extremely limited roster of bulls are probably the ones on the right side of the trade. My cautious bullishness on bonds is predicated on an assumption that inflation remains benign for a little while. Buckingham: The bond market has confounded even the bond experts. Next year you’re not going to make very much money investing in bonds. Interest rates could actually go lower depending on what happens in the economy. Gelinas: It’s dependent on the very low interest rates. I don’t know who buys a 30-year New York State bond for 5%! Do they really think interest rates will never go above 5% over the next three decades? My big concern is that people don’t understand what they’re investing in. How do you see earnings coming in next year? Rodriguez: They won’t be up 7% to 10%. They’ll be more in line with nominal GDP, depending upon how much financial engineering is done by corporate America in stock buy-backs. Arnott: Flat or down. They’re coming off an all-time peak as a share of GDP. So there’s a risk of mean reversion back to historical norms. That will be jarring to the markets. The soaring dollar is likely to hit earnings a bit. Buckingham: They’re going to continue to grow, the caveat being the global economic climate. So we may have to trim a little bit of the optimism. Gelinas: Bank earnings are at risk if we see a shift to higher interest rates. What’s the biggest threat to the market next year? Arnott: Current high multiples mean that the market has more downside than upside. A surprise resurgence of inflation would be a serious shock to the market. We live in a very dangerous world: Geopolitics is not likely to become more stable or benign next year. Rodriguez: The realization that earnings expectations are far too optimistic. Gelinas: The biggest is what happens with interest rates. Buckingham: Earnings. Fears about global economic growth are weighing on the market. What’s the probability of a stock market crash next year? Faber: The likelihood of losses and drawdowns increases the higher the valuations of a market. The biggest problem comes when prices eventually roll over. That’s when we would expect particularly poor returns in the short-to-medium term. Buckingham: Not a bear market or a crash, but it wouldn’t surprise me if we had a correction—a 10% decline at some point. Arnott: Inflation is the big issue for most investors with a portfolio that’s heavily dominated by mainstream stocks and bonds. The place to find interesting returns are in inflation hedges like commodities, REITs, emerging markets, and bonds [including] high-yield bonds. Faber: Right now inflation in the U.S. is in the safe zone—1% to 4%, which historically rewards equities with the highest multiple. Rodriguez: We’ll be going through disinflation before we finally get to Inflationville. Gelinas: We’ve already had a lot of deflation. We’ve had sustained inflation only in education, housing and health care, though even health care has started to flatten out; and we seem to want inflation in housing. But deflation would not be a good thing because we’re still in a borrower economy, not a creditor economy. What sectors do you like for 2015? Faber: In the U.S., financials, health care and energy are cheap. But we have a global focus. Valuations around the world are much better than in the U.S. There’s a lot more opportunity abroad. Rodriguez: It’s been more of a one-off, a name here or a name there. My associates at FPA are sitting on about 30% or 35% cash. They reduced their energy exposure by about 50%. We find very little in the small/mid cap range that is truly rip-snortin’ attractive. The value screen I’ve used for years earlier this year went to a new all-time record low of 27. The low prior to the 2007–2009 debacle was 35. Three days ago it was at 32. So what’s your advice to advisors, Bob? The underlying fundamentals of equities are deteriorating; so exposure should be low. Your readership [could] be deployed in risky assets. Do you believe that the assets you’re invested in compensate you with sufficient margin of safety for the volatility of what is likely to transpire in the next two or three years? If the answer is no, then maybe you need more liquidity in your asset-allocation structure. Arnott: The ultra-trendy growth side of the market has gotten a bit bubbly—Twitter, Facebook [etc.]. Pockets of technology and innovation are being priced as if growth will be stratospheric. These high-multiple growth stocks are past-due for a correction, at least in relative price. That means that 2015 is pretty likely to be a value-dominated year. So smart beta—severing the price of a stock and its weight in the portfolio—ought to fare very, very well. Gelinas: The hotel industry is very sensitive to emerging markets and any slowdown in global tourism. These markets have a new upper class who wants to use their money to visit cities in the West. But if global tourism slows down, you’ll see [workers in the U.S.] who can least bear layoffs and lower wages taking [those hits]. Buckingham: We go where the bargains are. We’re overweight in consumer discretionary, energy, industrials, materials and information technology. For example, in industrials we like Eaton; in materials, Yamana Gold. We’re underweight in consumer staples, financials, health care, telecom and utilities. Here, we’ve added, among others, Old National Bancorp, Amgen and Symantec. What are your further thoughts about international? Faber: Typically, we want to be investing where the economies are doing terribly. Usually that’s been a much better place to invest in stocks than where the economies are doing great. Valuations for foreign-developed and foreign-emerging are both much cheaper than in the U.S. Which countries do you like, Meb? A lot of the beaten-down Eastern European and emerging European countries that have done so poorly in both their economies and their stock markets are the best opportunities going forward for stock investors. These include Austria, the Czech Republic, Greece, Hungary, Italy and Portugal. Also: Brazil and Russia. But I don’t think you want to pick just one country; they’re incredibly volatile. So a basket of them makes a lot of sense. Arnott: Only emerging markets stocks and bonds are cheap. A focus on those seems to be the natural place to go for decent returns in 2015. I’m cautiously bullish on developed non-U.S. equities, which are mostly in Europe and Japan. Why do you like emerging markets, Rob? If the U.S. has a bear market, unlike past cycles, a sympathy market in emerging markets won’t necessarily be bigger than the U.S. bear market. It could set the stage for a really impressive bull market. Buckingham: We invest in ADRs of foreign corporations, with Europe representing the lion’s share; for example, Ericsson and Royal Dutch Shell. By buying a company that trades there, we have the ability to invest in the recovery in Europe. Arnott: The biggest threat to China is that the shadow banking system is over-leveraged, and private-sector debt has been rising a little bit out of control. Faber: China is getting back down to really cheap levels. It’s trading at a long-term P/E of around 12. We think China is very attractive. Buckingham: China is the fastest growing major economy in the world, and yet its stock market has been a dismal performer. It’s all about expectations, valuations and the likelihood of growth in the future that contribute to stock prices.